Ronnie shares the details this event for the Newsletter. Ron scouted this property back in February and all of the sign was on the opposite end of the property. With the rotation of crops I was back to the drawing board. I set up a stand where I could watch the bean field at 200 yards. Filming several bucks, including the one I took. I moved my stand into position. The first afternoon I saw the 8 point and two 5 points. The two 5 points came to my right, only 5 yards away and stood under my stand. The 8 point came to the left. The wind was blowing out of the southeast and he smelled me and ran off. I located one tree; 20 yards to the west that I felt I could climb. I went into town that night and bought a climber and repositioned my stand. The following day I saw only two deer. The next day upon arriving at my stand I saw the buck had rubbed a tree about five feet from the stand. This was to let me know that he knew I was there. That afternoon I saw only 2 deer that afternoon. The deer were skirting the end of the field where I was setup. The next day, going into my stand, I took a bottle of my urine and poured it on the other end of the field so my scent might turn them back to me. About 6 o'clock I saw the 8 point coming up behind me on a trail I had not seen. The buck came up to within "seven yards" from the tree and stopped. He didn't move for fifteen minutes! I'm sitting in the climber with my bow on the hanger. After standing there for that long, his next look was "straight up at me!" He turned around and walked out about 15 yards and stood there broadside! I reached and got my bow, drew and shot. The buck took off, ran about 50 yards, then turned and ran back towards me. He finally dropped 30 yards away. I have harvested a lot of great bucks but this one was special because it was my first scored "POPE and YOUNG." I give all the credit to HSP for having such good hunting property. 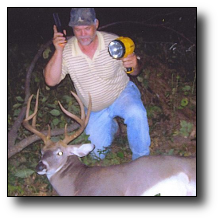 (Editors note): Ronnie is a "WORLD CHAMPION WHITETAIL TAXIDERMIST."